xHarbour Builder is a set of tools built around the open source xHarbour compiler from xHarbour.org . 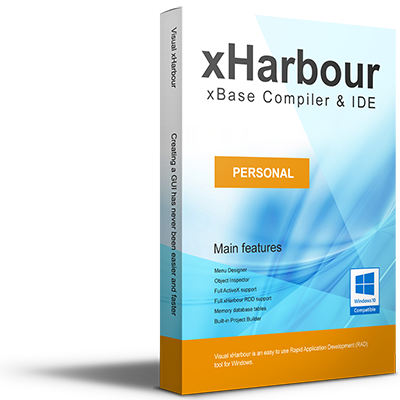 The xHarbour programming language is a superset of the well known xBase language, often referred to as Clipper. Though xHarbour is 100% backward compatible with the Clipper Language, xHarbour Builder adds many modern features and tools found in most modern compilers . Such features include Visual xHarbour, SQLRDD, xBuild Project Wizard, ActiveX, and many more. 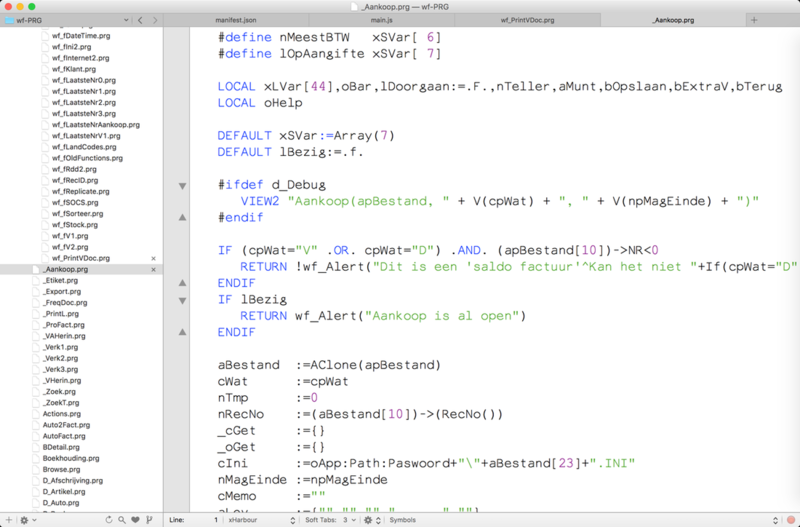 Practically 100% backward compatible Clipper Language. EXTENDED to offer the most complete set of modern features, while still retaining the simplicity and elegance of the xBase language. Self contained executable, require NO DLL’s, and/or any system dependency. Support for single user apps, through client-servers, all the way up to the most popular SQL servers. Open Source supported by creative and dedicated development teams offering practically immediate solutions to bug reports and popular features request. Guaranteed, professional support from the creators of xHarbour. xHarbour.com aims to establish xHarbour as the Development Product of choice, for the extended xBase Developer Community. xHarbour.com attempts to follow in the footsteps of Red Hat Inc and similar companies, merging the stability and longevity that commercial distribution offers with the freedom and security offered by Open Source - Free Software projects. This powerful combination has already demonstrated its tremendous market appeal and the viability of this business model. xHarbour is a free multi-platform extended Clipper compiler, offering multiple graphic terminals (GTs), including console drivers, GUIs, and hybrid console/GUIs. xHarbour is backward-compatible with Clipper and supports many language syntax extensions, greatly extended run-time libraries, and extensive third party support. The xHarbour Usenet newsgroup comp.lang.xharbour is an active community for discussing xHarbour related questions. For more information on the xHarbour language, please click the button below. 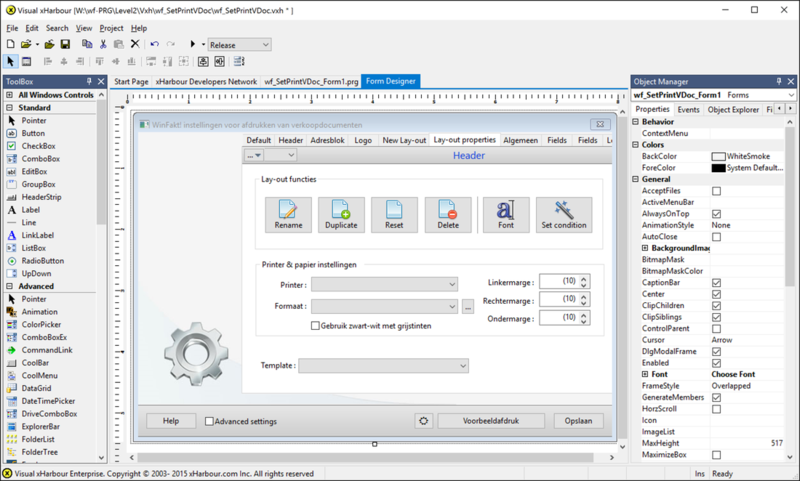 ﻿Visual xHarbour is an easy to use Rapid Application Development (RAD) tool for Windows. The power of VXH lies in its simplicity. But don't be fooled, underneath this simplicity you'll find the powerful xHarbour engine going at it at full throttle providing you with the speed and accuracy you need for your applications. Creating a GUI has never been easier and faster. VXH offers a complete set of objects which enables the developer to create any GUI in a matter of seconds. The VXH ToolBox offers any possible control which can be easily dragged and dropped on the forms. Creating new forms, interaction between forms, MDI forms, pop-up windows, splash screens, ... It's all right there, just one click away. VXH also supports the use of COM objects which, for example, lets you create your own video player. You can imagine that the possibilities are almost unlimited. Data management has never been easier with VXH's Data Components. Just link your database file to VXH's DataTable and add it to a DataGrid. Your data flows right out of the database file in to the grid. SQLRDD was created to access SQL database servers like Oracle, Microsoft SQL Server, IBM DB/2, Postgres, Sybase, MySQL, Firebird and others, from xHarbour xBase language just like you are used to use DBFCDX or any other regular xBase database driver. It's not just SQL access. It's a complete toolset for quick migration of your complete application to any major SQL database, adding transactional control, database level constraints, etc., as well as direct SQL access. "We decided to use Visual xHarbour for our projects to recycle the non-visual source code of our applications originally created in Clipper 5.2 and later converted to xHarbour." "Visual xHarbour permits me to extend the life cycle of my old applications and to move to new horizons (SQL, Internet, real GUI) . You decide how quick you want to move forward. New developments are really fast and intuitive. I like it a lot!" ​xHarbour Builder is THE tool to build professional business applications in record time. 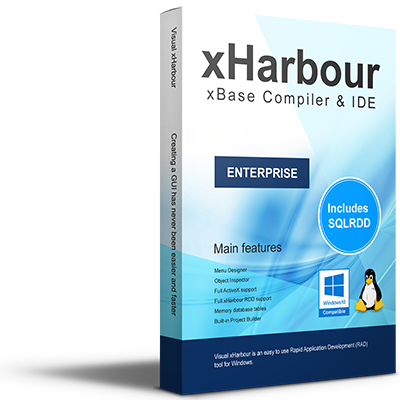 If you are ready for a GREAT programming experience, please go to our xHarbour Builder Shop and purchase the edition that best fits your developing needs. If you are not 100% happy, request a refund through email within 30 days and we'll gladly refund you in full, no questions asked. Simple as that!